This building is newly renovated, air conditioned and includes TV lounge, laundry facilities and vending area. Students are within a short walk to Wolf Field, the jogging track, and the Hulman Memorial Student Union. Meet up with your floor mates for dinner in the adjoining Sycamore Dining Hall or challenge the third floor to a game of flag football on the weekend. Mills Hall is located in the northeast corner of the four towers and is connected to Sycamore Dining. Each room holds two occupants. Each floor is co-ed. 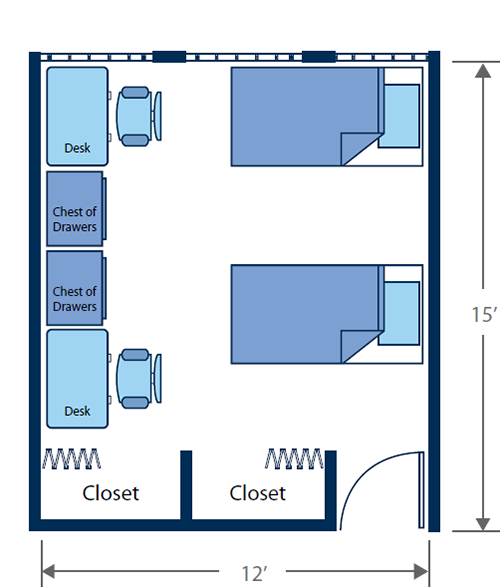 Roommates share a room, while pod-style bathrooms are shared by a few people from the floor.